A High-Low Art Lover’s Guide to San JuanFrom the streets to the galleries, there is beauty everywhere you turn. A Street Artist’s Fashion-Obsessed Alter Ego“PhoebeNewYork” is an Instagram avatar who wears chic clothes and provocative slogans. This Brand Is Putting Up Murals All Over New York CityGet out and ‘gram it. 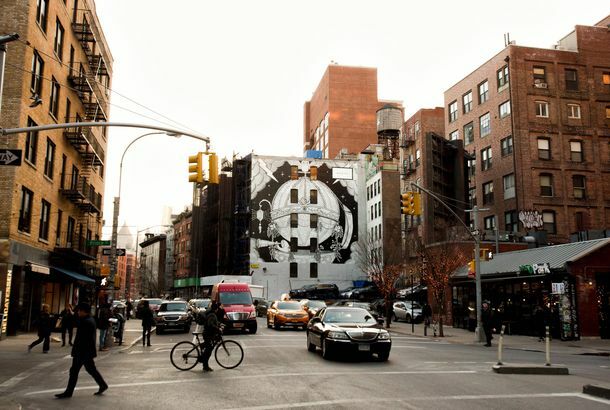 Check Out Gucci’s Massive New Mural in SohoArtist Jayde Fish designed an ode to wanderlust on Lafayette Street. People Dare to Imagine That Banksy, Like God, Is a WomanSacrilege. Banksy Looks Back on His Month in New YorkRemember that? ‘Gentrification in Progress’ at 5PointzStreet artists wrapped the former graffiti mecca in a giant banner. German Fast-Food Billboards Defaced With Handy Recipe GraffitiHow about some anarchist spaghetti Bolognese? Given the Chance to Buy a $60 Banksy, Most Don’tThe artist set up a sidewalk stall with few visitors. Entrepreneurial Brooklynites Charging to See Public Banksy WorkNew York City, America. Banksy Work Washed Away in Williamsburg, TooBanksy goes to Brooklyn. New Banksy Work in NYC Vandalized, Erased Right AwayAs expected. NYPD Arrests Street Artist for Mocking NYPD in PublicHe wasn’t hiding himself very well. Art-School Grad Behind NYPD Drone Posters Just Daring Cops to Destroy HimHe claims to have nothing to do with Occupy, but gave an anonymous video interview. Artist Behind Subway Etiquette Signs Now Shaming Bad Behavior AbovegroundWe’re looking at you, people who update Facebook while walking. Check Out This Crazy Parisian Street Art IllusionThe world is flat and round. Check Out This Very Cool Swedish Street Art IllusionHere’s “Mind Your Step,” by Erik Johansson. ‘Ghost Stroller’ Freaking Out Park Slope ParentsNeighbors wonder: misplaced memorial, art project, or sick joke?